Not long ago my answer to this question would have been not very much. Ever had a pivotal moment in life and you had no idea it was a pivotal moment? A lot of God’s work is like that…where in the moment you have no idea how big the moment really is until you look back. Recently I have been encouraged by the power of praying out loud, and it took me back to the first time I did that. I vividly remember sitting in my friends floor curled up in a ball, looking uncomfortable, feeling uncomfortable, and feeling terrified. Maybe it was because I was afraid of being honest with myself? My friend? Or with God? Not sure, but I am so thankful for my friend who stood by me and waited patiently while I grew in my faith in that moment. It wasn’t fancy, it wasn’t long, it wasn’t poetic. It was out loud and it was honest, and there is power in that. At the time I answered no. The Lord has been moving since then as He has refined my perspective and understanding of who He is and the importance of prayer in my life. God is working and moving all around us all the time whether we see it and are a part of it or not. When you are in a relationship with Him He invites you to join in and be a part of what He is already doing…and a major part of that relationship is prayer. Prayer is not only a conversation, but it is the humblest form of our need of God. Praying helps us recognize our dependence on the Lord. Praying out loud holds us accountable for what we pray. I don’t know about you but I am more likely to remember the prayers I intentionally pray out loud than the ones I say in my head. After you pray it is important that you WATCH. Watch what God is doing around you. Praying is not a magic genie in a bottle. God does not always answer every prayer and He definitely doesn’t answer them in the ways we think he should, but he moves. Prayer is powerful. The closer you grow in a relationship with God the closer your prayers align with God’s mission and in turn you see lots of movement and encouragement from the Lord. Jesus made prayer an important role in his life here on Earth and He made sure He taught his disciples how to do it. The High Priestly Prayer in John is a beautiful depiction of the relationship between the Lord and his son. In John 17:20 Jesus prays, “My prayer is not for them alone. I pray also for those who believe in me through their message.” He is praying for all believers. That includes me and you. Out of the whole Bible Jesus only speaks in a small portion of it and I find that it’s pretty amazing that a man of few words felt that it was important to not only pray, but model how to pray and then to spend time praying for all believers. He knew He was going to save us, but He prayed for us anyways! In Acts 6:4 the disciples said, “and will give our attention to prayer and the ministry of the word.” Before Jesus left them He had taught them how to pray. They prayed for the Holy Spirit to come and now they are giving their attention to prayer. Not to traveling around, not to preaching, but to prayer then the ministry. The ministry of the word is still an important part of Gods mission, but first comes prayer. The relationship with God, the growth in faith must come in order to spread the gospel or be involved in the ministry of the word. The disciples understood this by the time Jesus left them with the Great Commission. In fact a large part of their growth is shown in Mark 9:29 when the disciples weren’t able to cast out demons in a child and Jesus said, “this kind cannot be driven out by anything but prayer.” This is a pivotal moment for the disciples as they see that more time and effort in prayer is necessary in the relationship with God, which is a direct correlation to growth in faith. Their lack of faith and prayer was unable to cast out the demons. The Lord knows your heart, thoughts, and mind, but the difference is does He have your heart, thoughts, and mind? Because if He does then your answer to the question is yes. 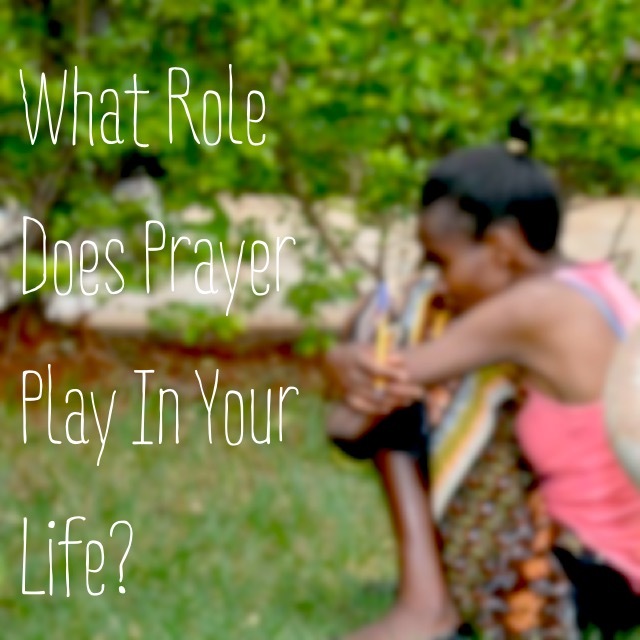 Yes…my life would be drastically different without prayer.